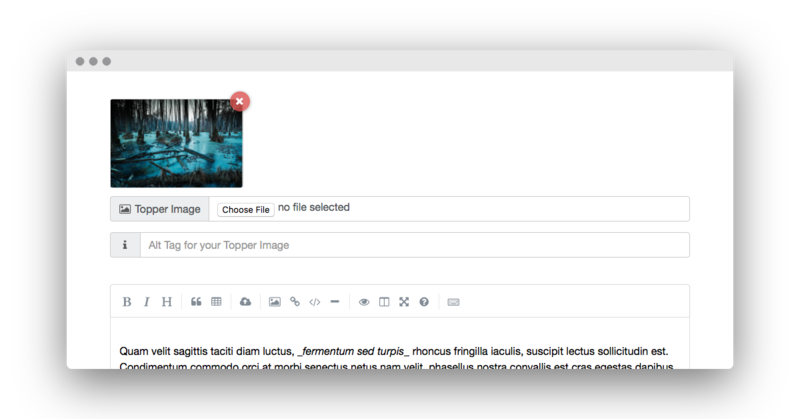 Say hello to easy image uploads in the Alloy Editor stack! The first thing that really stands out in the v2.2.0 update for Alloy is its newly added ability to upload images directly into your blog posts without needing to upload them to your FTP server on your own. This means that while writing your post you can use the new Image Upload button in the toolbar to upload an image to your post. After uploading your image via the Image Upload button the Alloy Editor will then create and insert the correct markdown to insert your image into the post. In addition to the Image Upload feature for your blog post’s content I’ve also change the way the Topper Image works. We think these two additions to the Editor will speed up everyone’s workflow and make life much easier. I didn’t stop at these features though. In fact I added several other new features, including a new stack that ties into both the new Topper Image upload capability as well as the existing Conditionals stack. This new Alloy stack is called the Topper Plus stack, and it will allow us to create big, bold, banner-like toppers for our individual, full blog posts. LEAD PARAGRAPH. Also includes in this update is a Lead Paragraph feature for the Full Post view. This new toggle will transform the first paragraph of your Full Post view into a Lead Paragraph. This will take on the same properties as is seen in the Foundry Paragraph stack when you enable its Lead Paragraph option. This gives a bit of design style to your Full Post view and it looks particularly good in conjunction with the Topper Plus design. HIDDEN TOPPER IMAGES. This new feature, which is found in the Blog Entries stack, allows you to hide the Topper Images for your blog posts in the Summaries view. This provides a simpler, streamlined view of your summaries while still retaining the Topper Image for each individual blog post, in the Full Post view. OTHER. I’ve also worked through several minor bug fixes and improvements under the hood, so to speak. This is a paid upgrade, right?! Nope. This is again another free update for Alloy, adding a great deal of new functionality and improvements at no added cost. As always, while this version of Alloy is good for an unlimited number of domains, we ask a small donation of just $10 for each domain past 3 that you will be using Alloy on. This will help us with developing Alloy even further and adding more functionality and features. You can find the Extra Domain button on the Alloy Purchase page if you’d like to help out with development. The update is available right in the Stacks plugin in RapidWeaver. Just do the normal Check For Updates and you should be presented with v2.2.0. Thanks Adam. I can’t wait to use it. Just using Alloy on one client site at the moment but I will use it on all soon. My client loves it and will love it even more with the fantastic improvements. This is a great update. I now have unequivocal proof that Adam considers all comments made, which is amazing customer service. Some time back I asked if there was some way to hide the topper image in the Summaries View. There wasn’t then, but there is now - thank you for adding this feature. Great update, especially the image upload feature. I don’t actually have Alloy yet and have a question. Can I place other Foundry stacks into an Alloy blog entry. Particularly image or a gallery stack or video stacks. I’ve been using Squarespace for a travel blog as the image gallery options are brilliant. This particular blog is heavy on visual content and obviously I can upload everything from iPhone etc but would like to move away from SS. Is it possible to enter a URL for the topper image in addition to loading an image directly? No, placing any stacks into your posts is not possible. 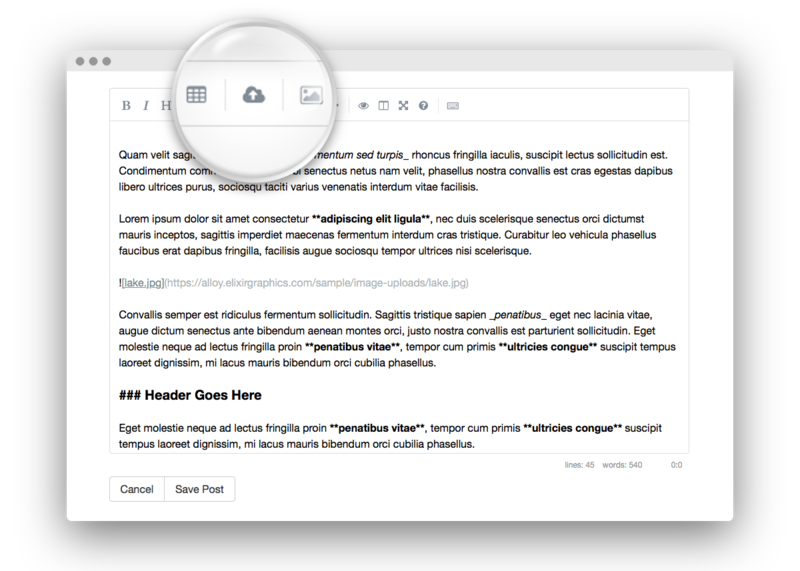 Your posts are written online in the Editor (or if you’re manually curating them they would be written in a text editor, but most will use the Alloy Editor for online blogging). The posts are written using markdown. Have a look through the tutorials videos on the Alloy site and you’ll get a better idea of the way that Alloy works. Especially take a look at the “Working With Blog Posts” video on that page. No, that is not an option in Alloy v2.2.0 and newer. This was a conscious decision. I found some users had asked me for remote image support from my stacks for a long time. When I added it in Alloy I immediately got a lot of feedback saying they could not use Alloy for their clients’ sites as they could not trust their clients to use FTP to upload and manage image files. The number of people who contacted me about this greatly outweighed the number of people that have ever asked me for remote image support. This will be the direction for Alloy for now. I’ll see how things go from here. I suspect this method will be better for a majority of Alloy users. Addendum: Of course if you’re manually curating your blog posts you can use any URL you want for your topper or images in your post. This has not changed at all. Any news on when/whether Alloy will allow tags and multiple categories? Nope, not yet. If and when that is an option I’ll make it known in update notes, a forum post, etc.